Abe (Joaquin Phoenix) is a burned out, impotent philosophy professor who’s looking for the will to live. A fellow teacher (Parker Posey) throws herself at him and a pretty and promising student (Emma Stone) engages him mentally, but he’s still, shall we say, unresponsive, until he starts plotting a hypothetical murder. Joaquin and Emma have an easy rapport that’s eminently watchable, when the dialogue’s not getting in the way. The story is partially inspired by Dostoevsky’s Crime and Punishment, about a university student who commits murder to prove that he is morally superior to other people. But both Dostoevsky’s student and Woody Allen’s professor are only pretending that murder would be to help others, or the world in general. In fact, it’s a pretty selfish pursuit, even when purely cerebral. Can thoughts of murder really be a “creative endeavour”, or is that just the typical justification of an unfulfilled philosophy professor? Woody Allen struggles to sound authentic around some of the philosophical arguments, and Joaquin doesn’t do a much better job conveying them. 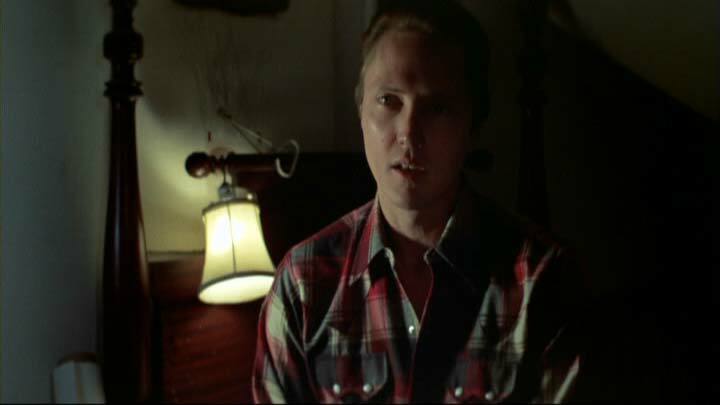 And Allen’s dialogue surrounding the erection difficulty is as stilted and awkward as only Woody Allen can be – which doesn’t quite sound right coming from Joaquin, even with his 30 pounds of pot belly. Allen’s more adept with the cynicism and the dark humour (not to mention age-inappropriate romance), and when the material’s good, he’s hired actors talented enough to handle it. So this movie is not without merit. It’s also just not very original (even among Allen’s oeuvre) or very necessary, and the unevenness almost drove me batty. This entry was posted in Movie Reviews and tagged Emma Stone, Half-assed, Joaquin Phoenix, Parker Posey, Woody Allen on August 29, 2015 by Jay. Colin Firth plays magician Wei Ling Soo (aka Stanley) brought in to a wealthy family’s home to debunk Emma Stone’s Sophie, a beautiful young medium who Stanley is sure is a swindler. 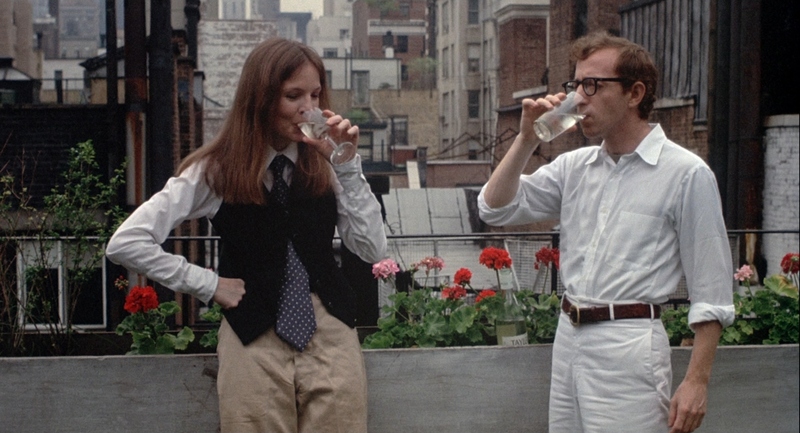 I want to say that Woody Allen films have been pretty hit or miss with me lately, only I can’t think of any hits. Last year’s Blue Jasmine cast an admittedly stellar Cate Blanchett but other than a great performance, I’m not sure the movie really did anything for me. 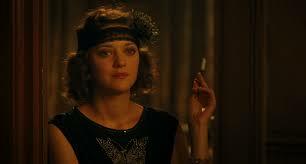 I was similarly unmoved by Midnight in Paris. His movies for the past couple of decades have been lighter and less ambitious (not to mention white-washed). This one, as a rom-com, is standard formula, but it does start off with some really great questions of belief. Stanley is a rational man who believes only in what his (5) senses can tell him. The convincing and bewitching young psychic have him doubting his entire existence, and for the first time, he’s feeling happy about life. 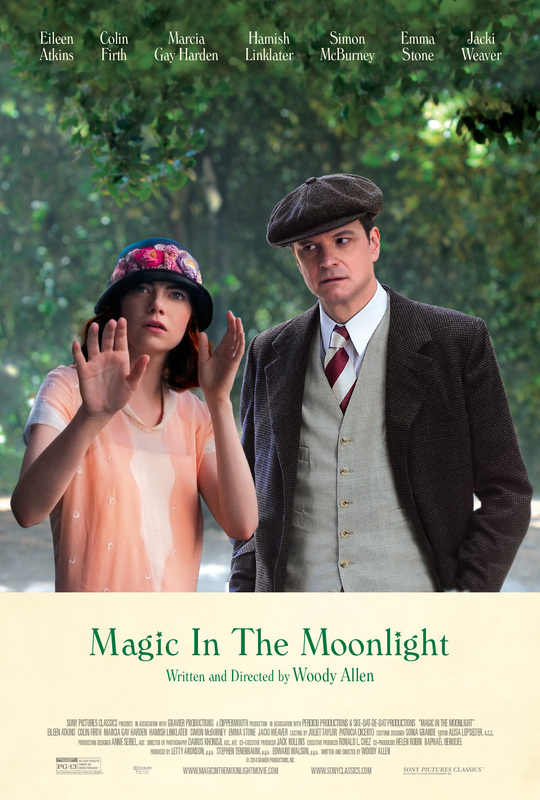 Magic in the Moonlight has some great dialogue, which Allen is known for, but also some heavy-handed expository stuff, which I find unforgivable. Allen’s motto of late seems to be quantity over innovation. He’s a very productive writer\director, but what is he presenting that is new? What he shoots is beautiful, but also predictable and safe. Colin Firth is the Cate Blanchett of this movie, he makes it worth watching. The romantic nature barely concealed under disdain and haughtiness and a dash of intellectualism. Swoon. Emma Stone I was less sure of. I asked Sean, is she very bad in this, or is she always this bad, or is she pretending to be this bad? We weren’t sure. But I was pretty sure that I felt a little creeped out to see Colin Firth kiss her. Now why is that? Emma Stone, the actress, is 26. But Emma Stone looks quite young and is playing quite young in this film. Hollywood makes no bones about pairing ingenues with daddy types, and either way, I am definitely on team Colin. He could tongue me any day he pleased even though at age 54, he is older than my mother. So here it is. At what point does what we know about a morally corrupt artist taint the art that he produces? 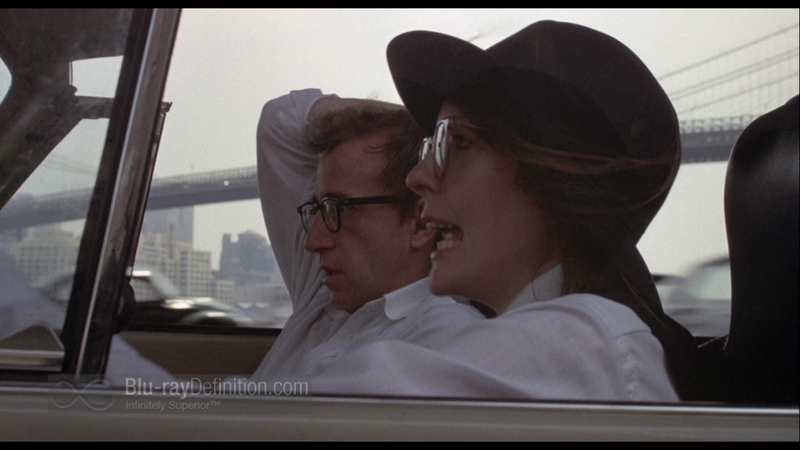 My repulsion to the kiss was not a conscious reaction to Woody Allen: film maker and child molester. But clearly these are serious allegations and so how do we feel when he continues to work out his neuroticism and sexual dysfunction on-screen? I’m not saying that art is confession (although it sometimes is), but I’m wondering at the correspondence between the characters he writes and the crimes we hear about in the newspapers. It’s troubling. Criticism must be within context. A movie written and directed by Woody Allen cannot be considered as wholly detached from Woody Allen the man. His female characters are never well-developed, and the men in his movies, including ones he’s played himself, are very often emotionally stunted, and almost always chasing after some uncomfortably young tail. So how do we watch Woody Allen movies going forward? Or should we not? This entry was posted in Jay and tagged Colin Firth, Emma Stone, Woody Allen on December 18, 2014 by Jay.